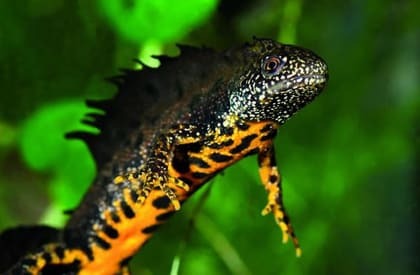 Great crested newts (GCN) are a European protected species. Individual newts, their eggs, and habitats used for breeding and shelter are legally protected. 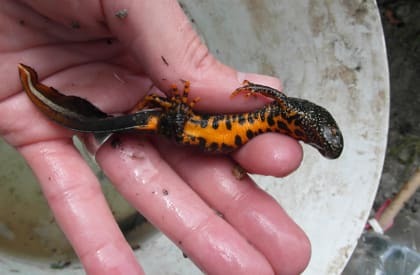 GCN are found in aquatic and terrestrial habitats including ponds, ditches, rough grassland (including allotments), hedgerows, woodland, scrub, log piles and gardens. They begin to congregate in breeding ponds from late February, leaving again between May and July. They forage and hibernate in terrestrial habitats, taking refuge in places which are protected from frosts and flooding. 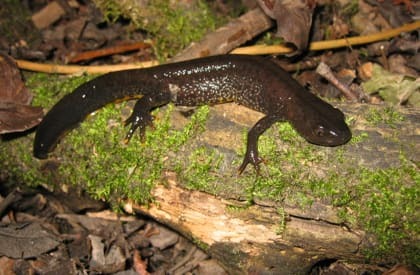 Other than DNA testing, which requires only one set of samples to be taken during the survey period, a minimum of four site visits using at least three other recognised survey methods (including at least two visits between mid-April and mid-May) is required to determine the presence/absence of newts in ponds. Six surveys (at least three visits between mid-April and mid-May) are required to make a population size assessment – required for mitigation and licensing. Survey of terrestrial habitat includes pitfall trapping and looking under refugia. Surveys are dependent on weather conditions and timing.